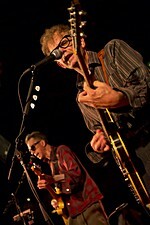 Having been a fan of legendary live performers The Feelies for a quarter of a century, their recent reunion and revitalization through the album Here Before, recorded and released after a 19 year long break, was a welcome opportunity to finally get to see them in concert - and twice that is. 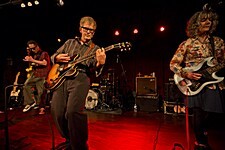 But first, a note for newbies: Please make sure to check out the recap of The Feelies' 30+ year history here. It's worth it. The first of the two concerts was at Club Helsinki Hudson, located in the small city of Hudson, 2 hours north of New York City straight up the Hudson River. The venue itself is equipped with small dining tables on stairway landings with a small dancing space closest to the stage, inspiring a relaxed atmosphere. One might say that the first of the two main sets the band played, dominated by their quieter songs from The Good Earth and Here Before, were more of a warm up for the second set. But even those 12 songs had the desired Feelies-ish intensity and restlessness, peeked by glorious "On The Roof" and "Higher Ground". Had it all ended there, I would still be quite happy with the event. But there was more to come. The second set evoked the inner raving werewolfs of the band members, with more songs from Crazy Rhythms and Only Life, turning the flood of melancholic chords into a cascading post-punk drone-like waterfall. The root to the latter element in The Feelies' music can be found in their admiration for the Stooges à la Fun House, confirmed by a great encore version of "I Wanna Be Your Dog". The second concert was at The Bell House in Brooklyn, a converted 1920's warehouse, housing a 350 people venue of rectangular shape with the stage on the long side. Definitely more of a typical dark and rough rock music nest, possibly inspiring the band to start out a bit more up tempo than in Hudson. But basically, the dramaturgic pattern was the same: The first set mellow and working as a kind of warm up to the second, more lively set, including highlights like "Slipping (Into Something)", "Raised Eyebrows" and "Crazy Rhythms". The lineup has been rather consistent since 1983. 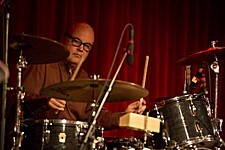 Stan Demeski recently earned himself a place on Spin's list of The 100 Greatest Drummers of Alternative Music, describing him as a working-class drummer with a mechanical influence - allegedly arguing that 'drum machines don't overplay'. Simplicity and precision are key words. Combined with the excellent skills and enthusiasm of percussionist Dave Weckerman, and Brenda Sauter on the base, the band gets a ubiquitous hypnotizing energy that is present even on the recordings - but live they really shine. Add to that the inventive and ecstatic backing guitars of Bill Million, and singer and lead guitar player Glen Mercer gets a great framework for his Lou Reed-like vocals and ingenious solos. Even if the scheme is a mere three-four chords, the two guitars go in and out of frenetically wild and intricately intertwined parts, turning the recurring patterns into a vigorous and jaw-dropping performance. Luckily, the performances were basically faithful to the original arrangements on the records, only supplied by even more energetic intensity. There was not much chit-chat between the songs, only a few times Brenda took care of toastmaster necessities in the fairly long periods of silence while Bill tuned or changed his guitar. And that's exactly as it should be. The Feelies are there for the music. If you want a standup show, go to the Comedy Cellar. 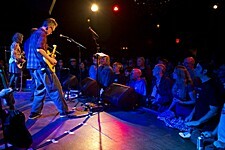 Some statistics for fellow fans: The Feelies played a whooping 34 songs in 2 sets and 4 encores at Helsinki Hudson, and 36 songs in 2 sets and 5 encores at The Bell House. This includes 10 cover songs at each venue. They played roughly 8 songs from each of the albums Only Life and Here Before, and around 4 songs from each of their other three albums. 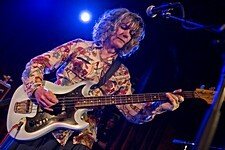 Please find the complete set list for Helsinki Hudson here, and for The Bell House here - both lists courtesy of their devoted sound man, Andy Peters, even including nice links to video clips for each of the songs. I have previously saluted the Feelies side project The Trypes, using their out-of-time qualities as a backdrop to question the basic drivers of popular music: news value, celebrity attraction, sales numbers. The same can be said about The Feelies: A most welcome reference to help the kids understand that stardom and innovative art comes in separate packages. Simply one of the most underrated bands ever (not only according to myself, ask Sonic Youth and R.E.M next time you see those guys). The encore frenzy spawned complaints from some of the old-timers, claiming their backs were aching from standing straight for three hours. Well, suckers - you might want to ask your resting home nurses to give you some exercise before next time you get a leave. To the rest of us, both concerts were a total bliss from the beginning to the very end, leading to slightly moist eyes and a lump in the throat as we exited into the pleasantly warm spring evenings of Hudson and Brooklyn. You may also want to check out our Feelies articles/reviews: Crazy Rhythms, Here Before, Only Life + Time for a Witness.